Paul Cassell opens up about the mandatory minimum case that still haunts him. Weldon Angelos was just 24 years old when he was sentenced to 55 years in federal prison for three marijuana sales. He is one of the hundreds of thousands of federal prisoners serving decades-long sentences for non-violent crimes, thanks to mandatory minimum sentencing laws created in the 1980s during America’s war on drugs. As a result, Angelos may not live long enough to experience freedom again. His case has haunted the federal judge that put him there. Back in 2002, Angelos was an aspiring music producer and a father of two young boys living in Salt Lake City. Determined to make it big, he founded his own record company, eventually collaborating with big names like Snoop Dogg. But Angelos told ABC News he also started dealing pot on the side. Federal authorities caught wind of Angelos’s dealings and set up three stings, using a criminal informant to buy about $1,000 worth of marijuana from him. But one critical detail made this case extraordinary -- during the deals, the criminal informant claimed Angelos had a gun in his possession. The case went to federal court and Angelos was convicted of selling narcotics while in possession of a firearm. These offenses fall under mandatory minimum sentencing laws, and prosecutors treated each of the three marijuana deals as its own individual offense. This is what is called “stacking” the charges, and it means Angelos was facing three prison terms, stacked on top of each other. All in-- 55 years in prison, with no possibility of parole. As many as 210,000 prisoners like Angelos are serving decades behind bars for non-violent crimes. The group Families Against Mandatory Minimums (FAMM) has complied hundreds of cases of non-violent offenders serving out what they call extreme prison sentences. 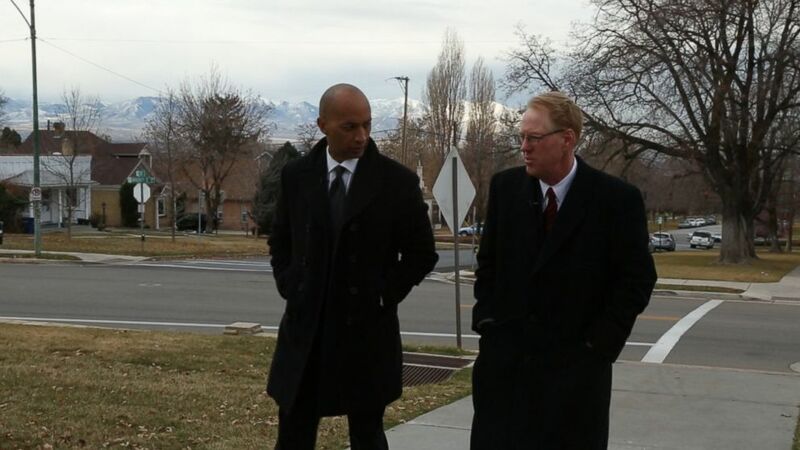 (ABC News) Paul Cassell, (right) a now-retired federal judge in the Utah circuit, talks with "Nightline" co-anchor Byron Pitts about the mandatory minimum case that still haunts him. Paul Cassell, who was appointed by President George W. Bush, now teaches law at the University of Utah. But he says the Angelos case still weighs on him, which is the reason he agreed to speak to “Nightline” about his ruling, something federal judges rarely do. When Cassell delivered his ruling in the Angelos case, he was quick to point out how severe the sentence seemed compared to other, violent crimes. Keeping offenders like Angelos in prison for virtual life sentences is also a heavy burden on the taxpayer -- Angelos alone will cost an estimated $1.5 million dollars by the time his sentence is through. “I thought the sentence was utterly unjust to Weldon Angelos, but also unjust to the taxpayer,” Cassell pointed out. “I think it’s just a waste of resources to lock him up for 55 years, I don’t really think anyone believe that’s an appropriate sentence." Since Utah has no federal prisons, Angelos was sent to serve his time at a prison in California, thousands of miles away from his family. (ABC News) Weldon Angelos's sister Lisa Angelos (center) is shown here with one of Weldon's sons, Jessie,(left) and "Nightline" co-anchor Byron Pitts (right). Lisa Angelos remembers vividly the day when her brother was sentenced. “The one thing he did say to me was that, we’ll never forget, he said ‘please, please help save my life,’ and I told him for as long as it takes, I will,” she said. Lisa has made good on that promise, writing petitions, filing appeals, even testifying against the use of mandatory minimums in Congress. She’s partnered up with Families Against Mandatory Minimums to campaign for her brother’s release. But after years of trying, the only way Weldon Angelos will leave prison early is if he receives a commutation from President Obama. Weldon Angelos is now 35 years old. He’ll be 78 by the time his 55 years are up. His two young sons, Anthony and Jesse, are now teenagers, and haven’t seen their father for seven years—the last time they were able to buy a trip out to California. Nearly every week, the boys talk on the phone with their father. During one such phone call, Weldon Angelos was able to talk to “Nightline” briefly. Lisa said she will continue to fight for her brother’s freedom. “To think that he will be in there until he is nearly 80 years old, I can’t give up on him, I just can’t do it,” she said.